Samson’s Toe, Langcliffe, North Yorkshire. Samson’s Toe Glacial Erratic Boulder, Langcliffe, North Yorks. Os grid reference SD 8321 6565. 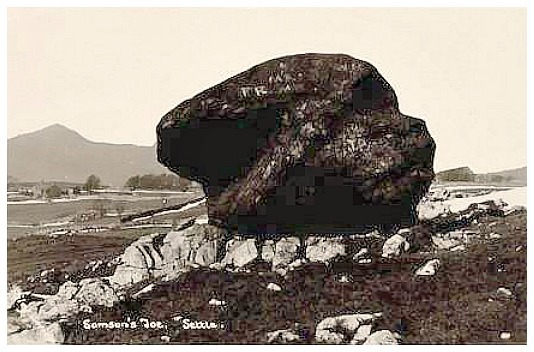 About 1 mile to the east of Langcliffe village, near Langcliffe High Mill, in The Yorkshire Dales National Park, stands a huge glacial erratic boulder that is locally called Samson’s Toe. It is located in an area of limestone ridges and scars known as ‘Whinskill’, which is probably a Scandinavian name. Here, in this barren, rocky land, there are a number of large boulders known as “rocking stones”. To the north the great bulk of Pen-y-Ghent can be seen as can the flat-topped Ingleborough further to the north-west – when the weather is fine and sunny that is! The town of Settle is 2 miles to the south-west. The great boulder can be found in a limestone-strewn area called ‘Whinskill Rocks’ just west of Henside Lane and close by a wooded area. Lower Whinskill Farm can be seen a bit further to the west. The glacial boulder called Samson’s Toe is approx 8 foot high and it stands (pivots) upon little limestone stilts that, because they have been protected have not eroded away, at the edge of a ridge of limestone. It is said to be possible to “rock the stone” but you would need many strong men to do this! The boulder has, however, suffered from graffiti some of which could date from the Victorian age. The boulder is apparently shaped like a giant’s toe – the giant in question being Samson. According to legend, he lost his footing when jumping across from Langcliffe Scar or Ribblesdale, breaking off his toe whilst attempting this. But, in fact, the boulder was deposited here at the last Ice-Age 12,000-13,000 years ago or more by retreating glacial flows moving from north to south – the boulder being picked up by the glacier somewhere to the north, perhaps the Lake District, or a bit closer to home. The great boulder is made from something called “greywacke”, a grey-black hard sandstone made up of fine pebbles, quartz, feldspar and other rock fragments. There are two other boulders nearby, just to the east over on the opposite side of Henside Lane, that make up the Whinskill Rocks – these are also referred to as “rocking stones” on ordnance survery maps of this area. Cook, David & Kirk, Wendy., Pocket Guide Rocks & Minerals, Larousse, London, 1995. Categories: Glacial Erratic, Samson's Toe At Langcliffe In North Yorkshire | Tags: Samson's Toe near Langcliffe in North Yorkshire | Permalink.